Ipe Deck Tiles create an elegant roof top deck or terrace. Deck tiles allow architects and planners to achieve level deck surfaces on rough grades. Ipe deck tiles and Hanover® pedestals pair beautifully to suit a variety of surface slopes. Hanover Elevators™ are ideal for projects between 2″ and 24″ in grade. Hanover® Elevator™ pedestals include features that add greatly to performance, ease of installation, and stability. The top plate’s rubber pads quiet and secure the tile to the pedestal. Other rigid (pedestal‐to‐tile) applications create noise and tile movement from foot traffic. These pads help to eliminate both conditions. Spacing tabs set a uniform 1/8″ space between deck tiles, and furthermore aid alignment. The top plate also provides over 42 in² of load bearing area. Padded top plates provide quiet, solid installations and eliminate tile movement. Coupler Eyelets allow easier bracing for installations over 16″. All components are made of high density, durable, impact resistant polypropylene. The Elevator™ is compatible with our other pedestal systems. Flexible shims are available for finer, individual leveling. The Elevator™ also works on top of the Compensator® Leveling System to easily adjust to roof slopes. Use the flexible leveling shims for final adjustments. Unlike other pedestal systems that use plastic and PVC shims, Iron Woods® Elevated Deck Tile System incorporates shims that eliminate “rigid on rigid” placement. Furthermore, these shims prevent deck tile movement. This provides additional stability. Shim Thicknesses are available in 1/8″ (white) or 1/16″ (black). Split the shims into halves or quarters for individual tile adjustment. Flexible material for easy use. Gives installation a more solid feel. The EPDM Rubber Pedestal is a flexible deck tile support pedestal that allows tiles to follow the natural contour of the roof. The EPDM Pedestal is suitable for both Architectural and Ballast applications where water drainage is required. When used in ballast applications, roof membranes are protected from the tiles. This 3/8″ fixed height pedestal incorporates 1/8″ and 1/16″ spacer tabs and leveling shims. As a result, installation is a snap. The EPDM rubber is resistant to severe weather conditions. Additionally, it has sound deadening qualities and creates a soft feel for walking. However, this pedestal does not stack. Therefore, use these only for low elevation support requirements. Make final adjustments with EPDM Leveling Shims. These shims prevent tile movement and additionally adds stability. Thicknesses are available in 1/8″ or 1/16″. We recognize the concerns of designers and installers regarding roof and deck applications on sloped surfaces. Iron Woods® Elevated Deck Tile System provides a solution in the Compensator®. The Compensator® permits a fast, easy installation and precise alignment of raised deck tiles. The base is high-density plastic. Therefore, water will do them no harm. When used with our other tile support pedestals, this patented unit will “compensate” for the roof slope and allow the installer to easily achieve a level surface for tile installations. Their unique twist‐to‐adjust design is user‐friendly. The system suits a wide variety of roof slopes. One Compensator® levels a roof slope of 1/8″. Several Compensators level slopes up to 1/2″. The spacer tab aids installation with leveling shims. These shims prevent tile shifts out of position and alignment. Consequently, this tab provides additional confidence that each tile is secure and in its proper location. High‐Tab® Pedestals stack easily without loss of performance from the higher spacer tab. Therefore, their versatility increases. High‐Tab® Pedestals turn and engage—one into the next—so that the integrity of the added height is still present in the top pedestal. Installs with other Hanover® pedestals in the Iron Woods® Elevated Deck Tile System. Are deck tiles the solution to your next rooftop or patio? It depends, but the Hanover Pedestal system is an attractive and practical answer to many site demands. They’re easy to install, therefore, labor costs are cut. The tiles are already assembled, and only the ledger areas will be cut zones. The field goes together quickly, and it’s also sturdy. 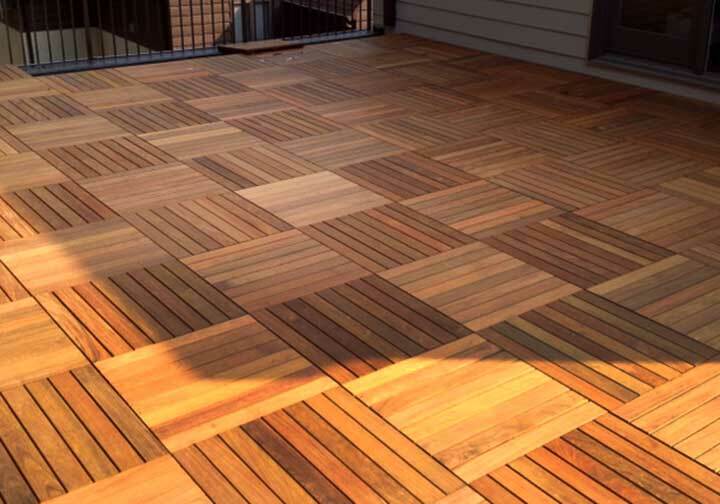 Get your quote today, and see for yourself why ipe deck tiles will be the best choice for your next job!